(Cambridge, MA) I saw something extraordinary at Oberon last night. Liars & Believers’ Who Would Be King is a beautiful patchwork of physical performance, storytelling, and boundless humanity. An original work by artists in residence at the LAB, Who Would be King is a re-mixed trove of biblical tales told in a compelling and timeless way with great humor, and great humanity. The boundless energy of the talented cast showcased their incredible range. 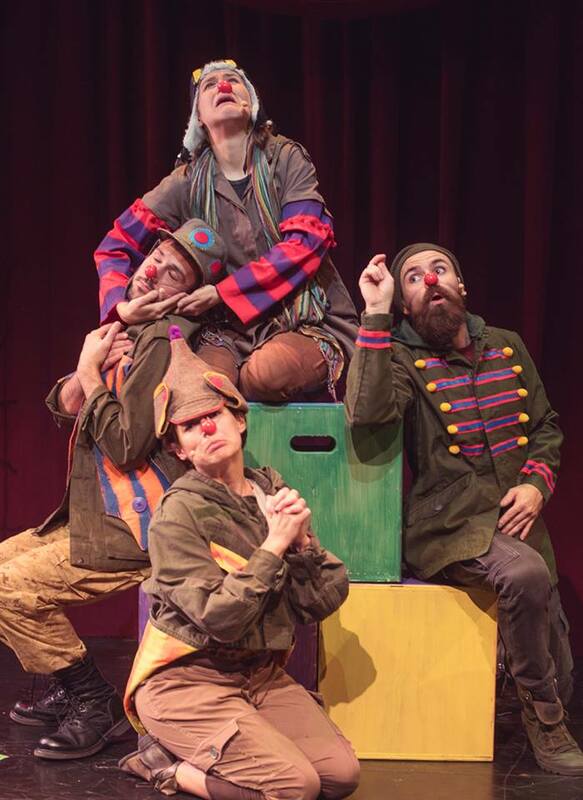 Each of the five cast members (Rebecca Lehrhoff, Rachel Wiese, Glen Moore, Jesse Garlick, and Veronica Barron) performed in a multitude of roles: from red-nosed clownish Bumbleheads to Angels and Kings. Perhaps most astoundingly, each cast member was nearly unrecognizable from one role to the next. It’s a rare and beautiful to see good clowning put to effective use, and Jason Slavick got simply the best clowning out of his cast; the energy required to sustain such a performance is simply incredible. The piece ran the gamut from clowning to utter graveness. As act two began to explore darker themes, the actors were able to bring their performances home. Foregoing the red-nosed circus clowning of act one, they showed incredible chops in their various roles as the war-torn tale unfolded. Only the highest caliber of performers would be able to make such a drastic tone switch seem not only possible, but natural. Kendra Bell’s costuming was minimalistic and elegant. Each distinct character had a look that meshed coherently with the world, and also told the audience a great deal about the character in question. Aaron Sherkow’s lighting design highlighted every moment in Oberon’s multi-faceted and complicated space to utter perfection. The music by Jay Mobley was the perfect compliment to the ups and downs of this epic tale and performed expertly to boot. Perhaps one of the most exciting elements of the show was seen in the efforts by Liars and Believers to make their performance accessible to a community for whom theatre might otherwise be prohibitive. The show was subtitled as well as described via audio description (on the November 13th performance only) so that an audience might be as inclusive as possible. I, for one, applaud these efforts and hope that other theatre companies will begin to embrace them. When I left the theatre, elated at the experience I had just had, I saw the news about what had happened in Paris. We need stories of humanity. Now more than ever we need stories of heroes, great kings, war, righteousness, the terrible consequences of madness in great ones, and the healing power of sense and kindness. We need stories of love, devotion, family, and faith. We need these stories. They are what reminds us of how human we all are. This entry was posted in Uncategorized and tagged Amanda Martin, biblical tales, Cambridge, Club Oberon, Danielle Rosvally, Glen Moore, Jason Slavick, Jay Mobley, Jesse Garlick, Kendra Bell, LAB, Liars and Believers, MA, Paris, Rachel Wiese, Rebecca Lehrhoff, stories, Ted Hewlett, Veronica Barron by Danielle Rosvally. Bookmark the permalink.